We, VANCO ADVERTISING COMPANY, are very encouraging and supportive for your business. We have strong connection with Japan and Japanese community in Canada. There are several successful websites and services we have produced so far shown below, we are greatly confident of that we are the one to be the partner of your business. Canada’s biggest information portal and classified website. 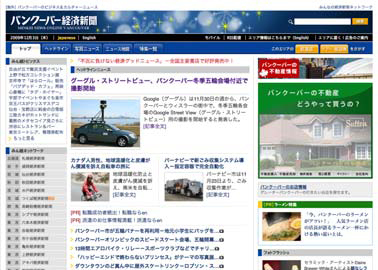 Vancouver’s online local news and services delivered in Japanese. 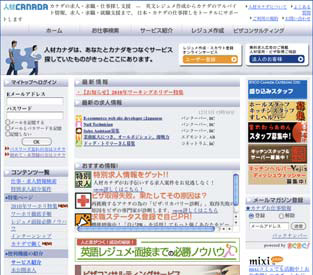 Canada’s biggest job and immigration portal for Japanese. Matching good baby sitter and family in both Japanese and English. ・users from extremely wide range. 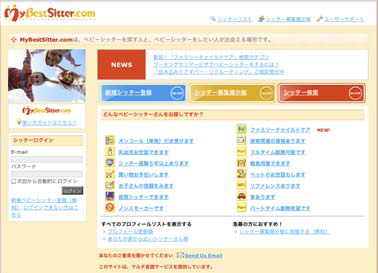 ・Many areas for banner ads. ・"Up and Coming" media for Japanese community in CA. ・Officially will collaborate with Yahoo! Japan for 2010 Olympic. Over 9,000 candidates have registered. ・People who seek job opportunity in Canada. ・Business owners who seek great person for business. ・People who are interested in Canadian immigration and visa. ・Website about finding job or great candidate. ・Option for "Special Job Ad"
Over 500 people have registered. ・Canadian and Japanese Immigrant Families who search a baby sitter. ・Expected candidates of baby sitter. Please do not hesitate to send us an email to info@vancoad.com if you have any question or concern about web production, advertisement, and other related services.